HUAWEI Ascend Mate has a screen-to-body ratio of 73% – the highest in the industry – which maximises your viewing pleasure for emails, documents, video or games. The 6.1-inch HD IPS+ LCD screen has a resolution of 1280 x 720 for unsurpassed clarity and colour accuracy, and ‘Magic Touch’ which provides enhanced screen responsiveness even with gloves. The Ascend Mate is slim and stylish, designed to fit comfortably in a single hand at just 6.5mm thin at its narrowest part. Operating on Android 4.1 and featuring an 8.0-megapixel AF rear-facing camera with HDR and 1.0-megapixel HD front-facing camera, HUAWEI Ascend Mate also provides dual MIC noise reduction technology, Dolby® sound system and stereo recording. 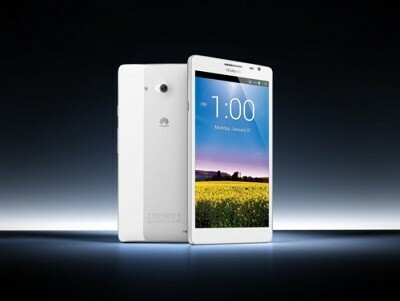 HUAWEI Ascend Mate features an Augmented Reality navigation application to help reach your destination, ‘smart reading’ functionality allowing quick reference to dictionaries, Wikipedia and Google Search pages, and ‘swift sharing’ to upload pictures, videos and other files two- to three-times faster than other smartphone users in a Wi-Fi environment.